We don't get many pregnancies round here. Apart from Ben who keeps breeding like a rampant rabbit because he loves the idea of the Government being forced to give him child benefit that he can spend on beer, fags and airfix models. He's currently up to 3 little ones but somehow I don't think it will stop there. The sheer fertility of the ginger still astounds many. 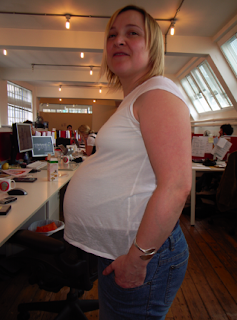 Anyway, we're not talking about Ben today, we're here to pay tribute to lovely Lou Turner, who heads up our creative services, is rather heavily pregnant and will unfortunately be leaving us soon. Now we don't think Lou's proper married but we hope her fella will do the decent thing and at least hang around until she drops the sprog. Lou has been wonderful, firm, good humoured, firm, happy, firm and great fun. She's also been quite firm with us. We'll miss you Lou. Come back soon when the breast feeding has started so we can all take some piccies.